Growing up I always loved Halloween – I mean what kid doesn’t! Duh – you get Halloween candy. Actually funny story – my dad’s birthday is on Halloween! One might think, how fun is that? But growing up he hated it! Everyone was too busy wanting to celebrate Halloween to celebrate his birthday! So sad! Rude kids. This Halloween was Jake and my FIRST REAL ADULT Halloween! Yes, indeed we have been adults on Halloween before. But we have always lived in apartments, or been travelling – this was the first Halloween we were at home and had to prepare for trick or treaters! I was so excited but had NO idea how much Halloween candy to get – nor did I realize how expensive it was! I only bought two bags because I figured, how many kids could we possibly get? Day of Halloween – I start doing some research… a.k.a. googling about the typical Halloween crowds in my neighborhood. The census: last year some houses got about 10 trick or treaters, while others got ONE THOUSAND!!!! UM WHAT? People who lived near the park, which Jake and I do, claimed that they got up to 1000 trick or treaters! Naturally, I freaked out. I went to the store and bought about FIVE more bags of Halloween candy. Gatsby, Daisy and I got all excited and waited by the door patiently for our trick or treaters to arrive. Around 6:30pm, there was a steady stream about 30 people! I was like WOAH – this is going to be crazy! And then… that was it! We had a few more trickle in here and there. But I was FAR over-prepared. So great – now I have all this Halloween candy… Snickers, Reese’s, Hershey’s, Krackel, and more I could not possibly let this candy go to waste! I looked in the cabinet and that’s when I saw it – a box of brownies. 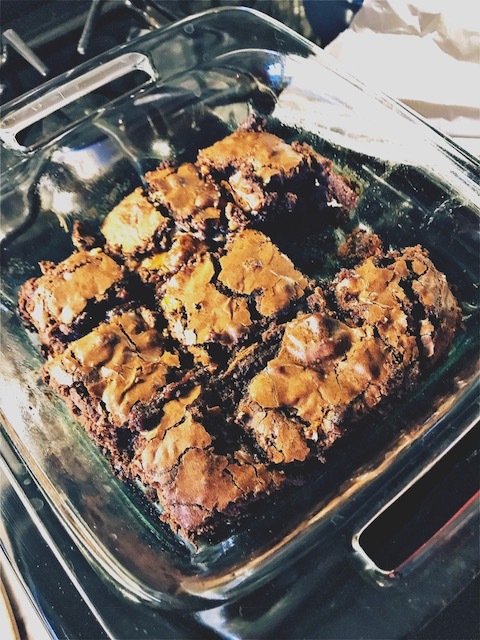 Oh yeah – Leftover Halloween Candy Fudge Brownies here we go! The EASIEST way to keep your leftover Halloween candy from going to waste! 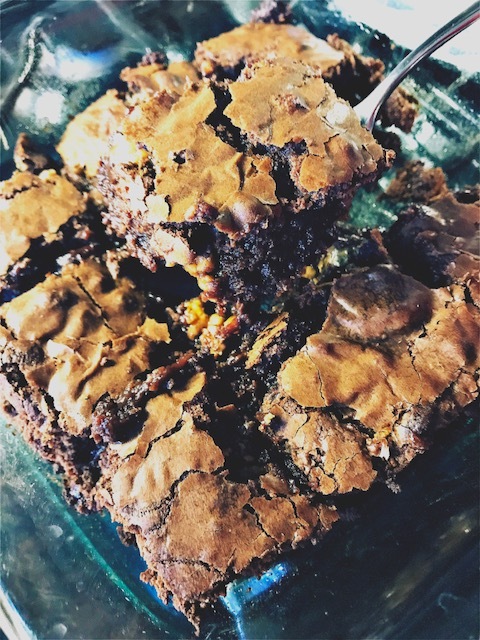 Seriously – all you have to do is prepare the brownie batter as you normally would, then add the unwrapped/chopped candy, throw in the oven – and BOOM! 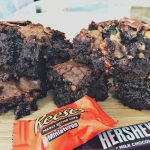 Melty chocolate fudge brownie Halloween candy HEAVEN! 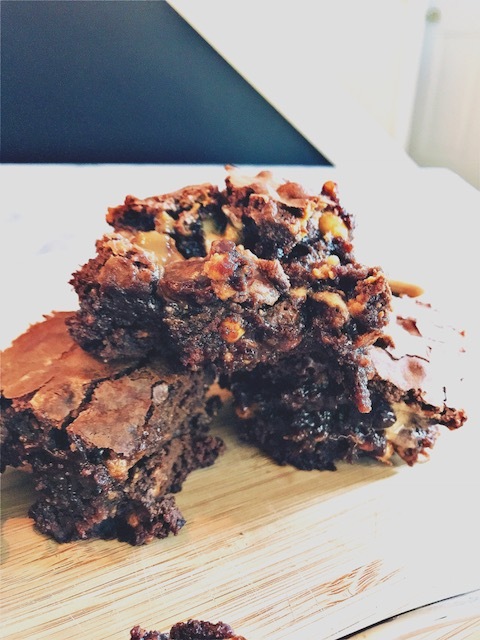 I made these rich fudgy brownies with Snickers bars (traditional, peanut butter, AND crunch), Hershey’s bars, Krackel bars, and Reese’s Peanut Butter Cups – so they were dense with chocolate, caramel, nuts, peanut butter. But you can put any type of candy in that you have! I would suggest sticking to chocolate based Halloween candy – just because chocolate is amazing. And I would also suggest avoiding any candy bars with a cookie filling – for example, Twix bars are my FAVORITE candy bar. But I don’t think that the cookie layer bakes very well. As always, you do you! Got leftover Halloween candy? Waste no more! 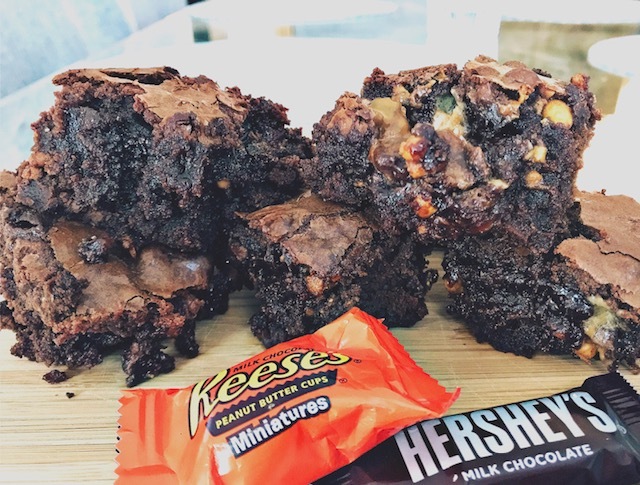 Make these incredibly easy and delicious Halloween candy-packed fudge brownies! Richly dense with as many different types of candy as you'd like. My favorites? 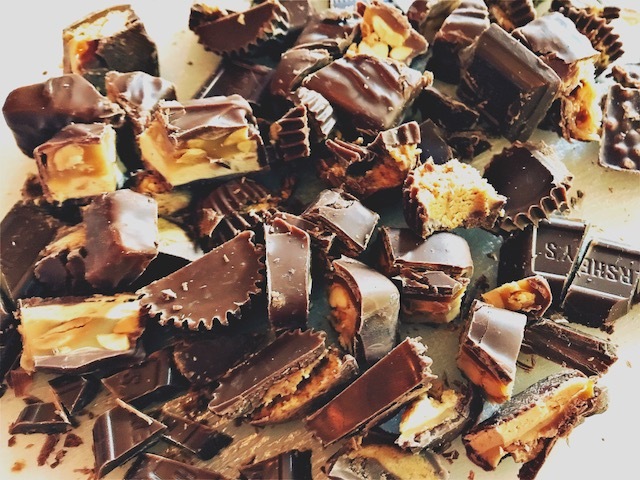 Chocolate, peanut butter, and caramel based bars! Enjoy! Preheat oven to 350F. Lightly coat brownie pan with non-stick cooking spray, set aside. (For thick brownies, use an 8 x 8 inch pyrex pan - makes 16 brownies; for thin brownies, use a 9 x 13 inch pyrex pan - makes 24 brownies). In a medium-sized mixing bowl, prepare brownie batter as you normally would. For a boxed recipe, follow directions on box (add eggs, water, and oil - mix to combine). Add leftover Halloween candy to brownie batter, stir to combine. Pour batter into greased pyrex pan - spread evenly throughout pan. Bake at 350F for the recommended amount of time on brownie batter recipe (for 8 x 8 inch pan, likely 50-55 minutes - for 9 x 13 inch pan, likely around 25 minutes). Once brownies are cooked, remove from oven and allow to cool. * Slice and serve warm or allow to cool and enjoy at room temperature with milk, hot fudge, or even ice cream! *Insert a wooden tooth pick into center of brownie pan to check if brownies are done. Note: chocolate may come out on the tooth pick (this will look smooth and creamy) - brownie batter should not come out (wet and oily). Hayley! 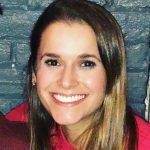 What a great idea–a creative brain you have!! Lol. I read this literally MINUTES after giving away my leftover chocolate-based candy to the pest control technician–DARN!! But such an easy thing, I will surely remember for next year. Nice job and thanks!